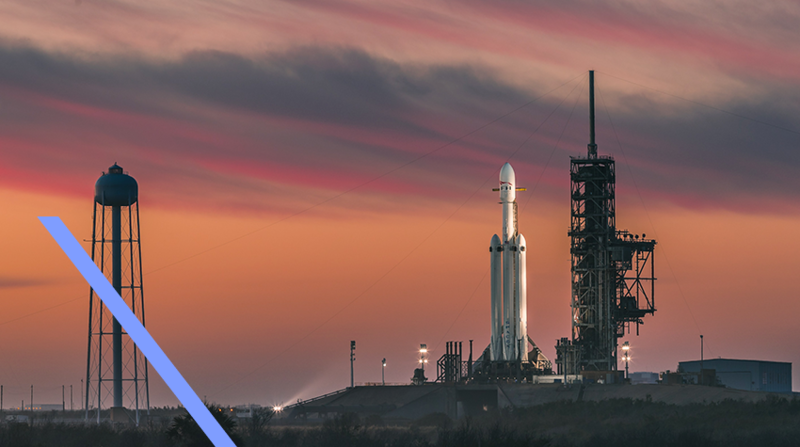 On February 7th, 2018 people around the world watched with interest as entrepreneur Elon Musk launched his Space X brainchild, the much-anticipated Falcon Heavy Rocket. The unassuming (or at least as unassuming as a rocket can be) Falcon Heavy was docked and launched from the famous Cape Canaveral, Florida. Overall, the launch was a resounding success, with 2 of the 3 outer cores doing something which until recently had been the preserve of science fiction films only; returning to earth 10 minutes after launch and successfully landing. But what can content marketers learn from this event? At its peak over 2.3 million viewers tuned in to watch the launch of Space X’s Falcon Heavy on YouTube. Surpassed only by Red Bull’s Stratos jump back in 2012, which achieved 8 million simultaneous views, the live rocket launch event was a massive success. Live streaming has been on the rise for the last few years and in 2018 continues to be one to watch. With technology continuously improving, the possibilities of what your live stream could achieve are really limitless. Don’t panic! Your brand doesn’t need a supernova sized event to make a big impact! Elon Musk is renowned for admitting when he’s made a mistake. The eagle-eyed reader will have noted we mentioned that only 2 of the 3 outer cores successfully made their landing. The third -which was planned to touch down on a drone ship – instead hit the water at over 300mph, exploding on impact. And it’s not the first time something like this has happened. In September last year Musk released a video of his favourite Space X explosions. But rather than deterring people from the brand, Tesla (the partner company of which Elon Musk is also CEO) saw a noticeable spike in its share price. Approach this one with common sense obviously, but if nothing else Musk has shown that there is value in admitting when you’re wrong. Not only does this help to humanise the brand, making it more relatable to your potential customers; but also provides valuable social learnings by opening channels of communication. Ask any successful business leader and they will tell you that their biggest successes have come off the back of their biggest mistakes and failures. Angle the story right, make the lessons learnt inspiring to your audience and you too could be well on the way to positive PR coverage. Lesson 3) Keep the conversation going! Even after all the drama of the launch itself, fans were able to watch the live stream of a mannequin riding around in Musk’s old Tesla (we know, we did a double take when we first read that sentence too!) Thousands across the globe remained captivated with the video, proving that we’ve only really scratched the surface when it comes to the future of Space Exploration. Luckily your brand can probably do things on a significantly smaller (and certainly more grounded) scale, but it’s as important as the event itself to keep the conversation going afterwards. Once you’ve captured any prospect data, make sure that what you’re providing prospects post event is as valuable and useful to them as all your pre-event coms. Whether it’s a further webinar to broaden their knowledge or a great new eBook jam packed full of useful research; continue to help your prospects during the decision process by making sure everything you provide has a purpose.